The Fair at the PNE is conveniently located on Hastings Street and Renfrew Street in beautiful Vancouver, British Columbia. 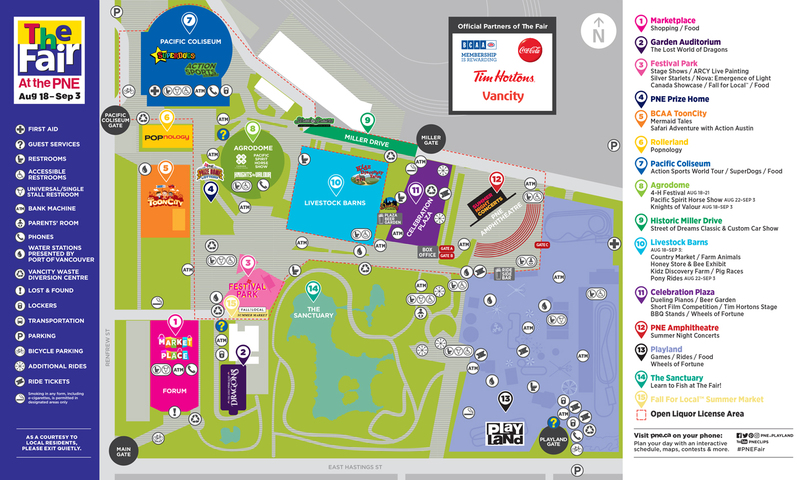 The Fair map provides a bird’s eye view of the annual summer fair including rides & attractions, food & beverage kiosks, lockers, washrooms and telephones. We encourage you to use public transportation. In addition to regular transit routes, Translink has boosted their bus service during The Fair. Buses include the #16 PNE Special from 29th Avenue Station stopping at Renfrew Skytrain Station; #210 PNE Special from Phibbs exchange in North Vancouver. For further information please call 604-953-3333 or click here. We encourage those who drive to park in one of the lots onsite. Lots are located at gate six located off Renfrew Street and gate nine located off Bridgeway Street. Additional parking is also available at Hastings and Windermere across the street from Playland. Parking for disabled patrons is available through gate two located off Renfrew Street as well as gates 6 and 9. No overnight parking is available and oversized vehicles will be charged per number of spaces used. Parking is $20 including tax (cash, debit, Visa, MasterCard, and American Express accepted). Traffic Alert: Roadwork is occurring on Hastings Street in Burnaby near Boundary Road which can cause slow traffic. Please plan an alternate route if you are coming to The Fair from the Tri-Cities and Burnaby. Limited VIP Reserved Parking is available for $25 including tax. Purchasing a reserved spot will guarantee a parking space for you for the day selected onsite at the PNE inside Gate 6 by the Pacific Coliseum. Limited spots available per day. Bicycle valet service is available inside Gate 1 (corner of Hastings & Renfrew St.). The PNE’s bicycle valet is a friendly and convenient bicycle parking service. It’s like a coat check for bikes—completely free-of-charge and secure. Bike racks, without valet service, are also available outside Gates 5 and 13. The main airport serving the Lower Mainland is Vancouver International Airport (YVR) but guests may also fly into Abbotsford Airport (YXX), a 40-minute drive east of the PNE site. The PNE is located approximately 45-minute drive north of the Peace Arch US Border Crossing. It is an easy day trip or weekend getaway for residents of Bellingham, Burlington and the Seattle area of Washington. Get in touch with us and we’re always happy to point you in the right direction.